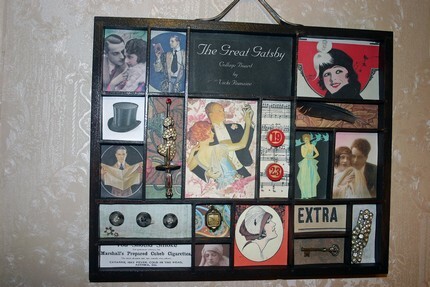 Vicki Romaine of the Lunagirl Moonbeams Design Team has outdone herself this week to create this amazing Great Gatsby-themed collage board featuring 1920s images and embellishments. 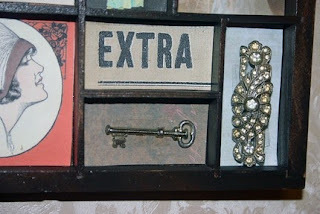 She has used several Lunagirl images plus a wonderful variety of found objects, such as keys and jewelry and Bingo tokens, and pretty backing papers. 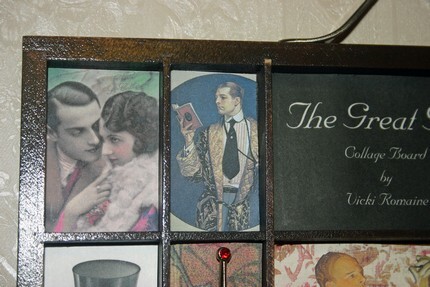 She started with an old printer's tray. I love these old trays and shadow boxes -- anything with lots of compartments! This inspires me, I hope it inspires you as well! Thanks, Vicki! 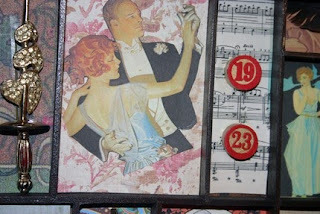 Don't forget to visit The Cheerful Stamppad to enter Vicki's blog challenges, and don't forget to enter your 1920s creation in my blog challenge! Can't wait to see what you create.